Hey Liz, Lovely time at your house. Hope it wasn't much of a clean up....wild crowd. I found a gavel that a law student left behind at QU. I will bring it for Joe at the next meeting. Bless him trying to get a word in... (and no support from his buddies) surrounded by 10 or so women all talking at once. Terri do not even think of not coming to a meeting! It would not be the same without you. Because the meeting is on a Saturday, we could go to the Vineyard from 4-8. Then see where that leads. Just an idea. Have a great day everyone? P.S. Mary, how was your nephew's play? It was great seeing everyone Friday night! I had a blast! Now I know what everyone was talking about when they said how much fun the meetings are! In defense of the smashed wine glass - I think I saw Mary Pashley moving my coffee table as I went to put my glass down! My home is always open for meetings - however you may have to supply your own wine glasses - my supply is dwindling! Let me know if we need a place for May 9th! By the way, I do still have my T-shirt. We're off to fulfill one of our dreams.... visit Australia and to explore the Great Barrier Reef! 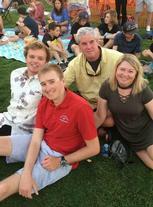 More importantly, we'll be spending some family time with our son, Pete, who is studying at MacQuarie University in Sydney. As an added bonus, we'll be catching up with fellow classmate, Scott Singer! We'll report back upon our return. Joe, Cinco de Mayo? Hi Sue - You've really done an amazing job with the website, very impressive! Just a thought - have you posted the reunion to classmates.com anywhere? I quickly checked it out but didn't see anything. I think that might be a place where people may look first if they are interested. If I can help out at all, just lmk! Is the reunion meeting this weekend at the vineyard? Now that I have my glasses on and my brain back on, I found out my own answer -- see you all Saturday at THE VINE. I'm looking forward to Saturday's meeting at the Vineyard. Don't forget... ALL ARE WELCOME. Our "committee" is made up of anyone who would like to get involved and have some fun along the way! If you have any extra wine glasses, bring them too!!! Ted Krol- your email address you supplied is not working, anyone trying to email you is having it kick back. Please verify- Thanks! Just a quick note to say hello classmates!!!! I will update my profile soon to fill you in on my life since graduation.. Great to see you here!! Hey ya'll, safe in Germany. Arrived here about 2 weeks ago. Been living with the family in hotels for over a month now. We'll be moving into our german home soon. Germany is great, but it has changed quite a bit from the last time I was here (87-90). Commodity prices with the euro are wicked high, fuel is ridiculous ($6-$8 a gallon, depending on octane) but the autobahns and the vehicles are top notch. I was doing 220kmph the other day in a 1.8 BMW with a slick close ratio 6 speed. The price of the car is about 50% of what the average US home has been devalued to, but the driving experience is well worth it. The beer is great, and the food even more so. The wine and clothing are high quality also. High taxes are simply a way of life over here, with the german version of sales tax being a minimum of 18.5 percent, in addition to taxes on income, savings, etc. All I can say is actually living in a society where everything is taxed at this rate should be a requirement for those who propose increasing US taxes. Best of luck to you and your family, hope you have a great experience there in Germany!! Watch those speed limits! Thanks to Greg and Veronica for hosting the Reunion Meeting on Saturday, August 22. The food and drink...WOW! You truly outdid yourselves! AND we actually accomplished a great deal... Look on the web site's home page for further reunion details. I, too, wish I was attending the EVENT OF THE YEAR! I am so jealous of all of you that will be there. I know it will be a fantastic time. I look forward to seeing lots and lots of pictures! Sue, thanks again for all you have done! Well .....what can I say AWESOME reunion, just got out of bed---no I can't drink like I used to! But I think a good time was had by all. Joan, I hope your head is OK, quite a dance move out there! We had a great time, and it was amazing to see how great everyone is doing. Thank you all for your support of the website, it will live on for at least a few more years and many thanks to all the committee members for everything you have done and a HUGE thank you for the wonderful gift basket! OMG it is awesome!! You are all the best!!! The Reunion was great & I am so glad I went. It was so nice to see all of you. For those of you who missed it I am sure ther are some pictures floating around on facebook or U-Tube. I hope we dont have to wait another 20 years to have another one. To all who worked so hard to put this together I commended you on a Job Well Done! Well I need to tend to my aching body, it appears I may look young but my body felt the pains from the dance floor, but it was worth it. Class of 79 was & still is mighty fine. Hi Classmates... I heard some sad news today that Nora Glatfelter passed away after a long illness. May she rest in peace. My prayers go out to her family and friends. I remember her as being friendly to all and she was very sweet. Thanks for the smiles Nora.